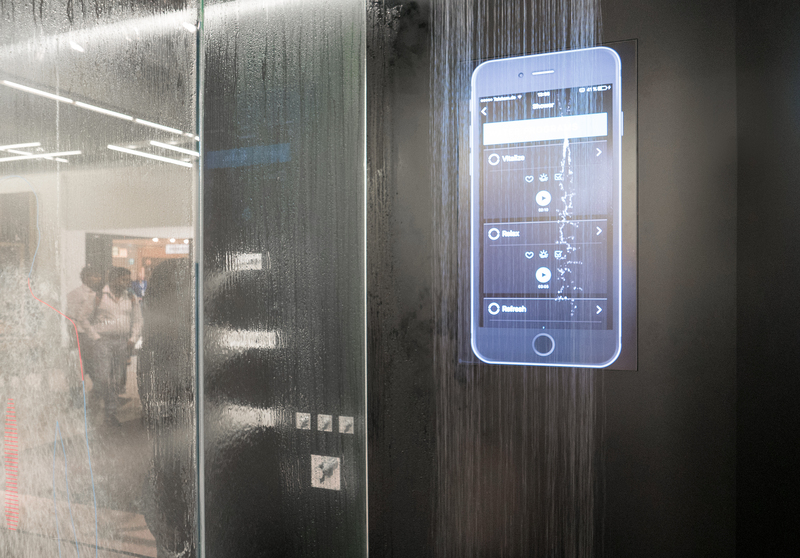 Wireless shower: Dornbracht presents a shower that can be programmed by Smartphone. Many of the electronic gadgets for bathrooms leave you asking whether they are necessary or if not, then so what... What on earth are they supposed to do? Rarely do they offer added value and more than what proven technologies already do – a whole lot simpler. How sensor electronics, playfulness and thought can be mixed to yield a persuasive product is something Burgbad achieves with their “rc40” mirror cabinet line. It’s absolutely no exaggeration to say: This is one of the best new products at this year’s ISH. The abbreviation “rc” stands for “room concept”, one of the company’s furniture lines. 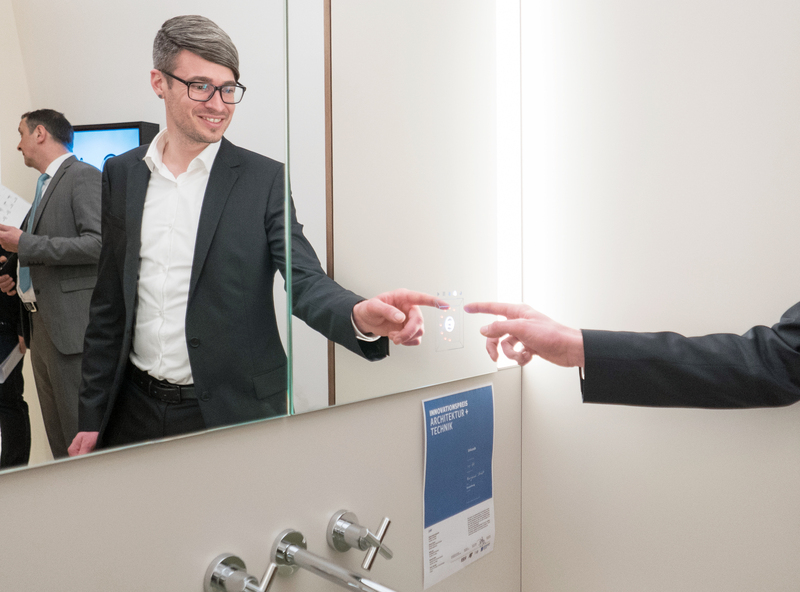 The new mirror cabinet boasts LED lighting for the user and the surrounding, which is standard - but the name Bartenbach promises something unusual. This mirror is interrupted at a specific point by a backlit display complete with brand logo. If, in front of it, you perform an easily learned gesture with your fingertips, the little cabinet’s lighting qualities come into their own. The LEDs on the sides indirectly exude light upwards. 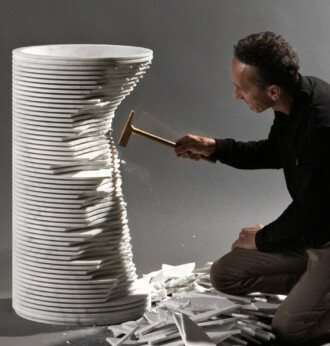 You can control them without touching them – by circling your fingers in the air just in front of the mirror. There are preprogrammed lighting moods that correspond to the time of day. In the morning a high portion of blue light to get you active, in the evening and at night a slightly reddish color comes into play to avoid suppression of the brain’s melatonin production. You can also easily activate a special light that represents skin colors better. Once a company owned and operating in Central Germany, since 2010 Burgbad has been part of the Turkish Eczacibasi Group and in the guise of “rc40” has a real highlight in its program. First deliveries are scheduled for July 2017. The new bathroom item costs about 600 euros more than the conventional Burgbad mirror cabinets. Out-size Smartphone displays were on show at many trade-fair booths. Usually in order to symbolize progress. 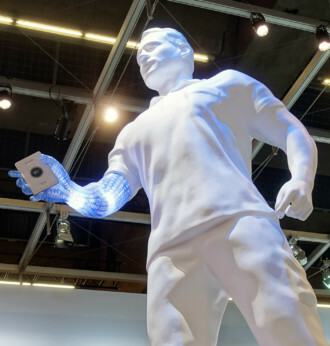 And at time to calm users’ nerves: “Your heating system feels fine,” the one at the Viessmann booth said, where digital holiday functions were presented. At Dornbracht, the shower program can be pre-selected by Smartphone along with the latest health-fostering acupressure shower jets. 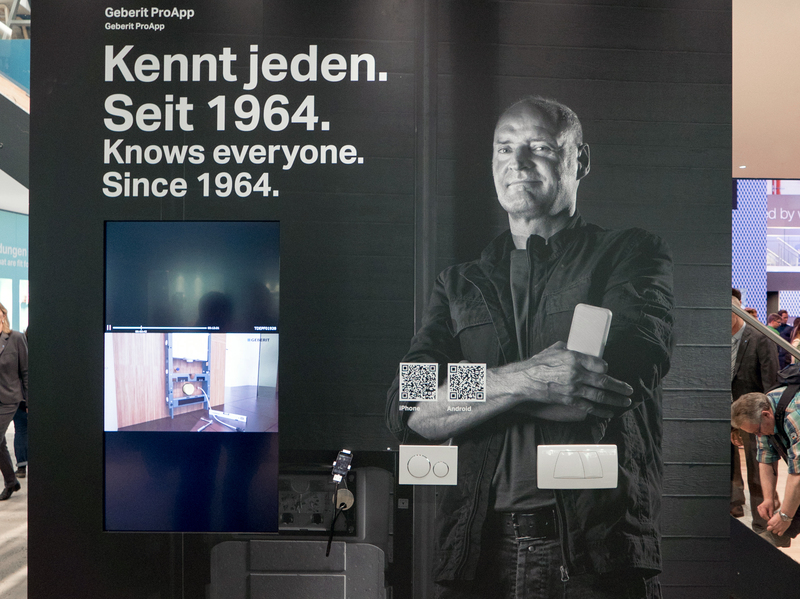 At Geberit there’s a program for technicians called “Knows them all. Since 1964.” Well if ‘them’ means all the spare parts for flushes and urinal controls. At Duravit there were countless highly interesting novelties ready to go to market, and also a slightly offbeat study on the urine-analysis toilet of tomorrow. Smartphone App and high-tech toilet are bonding evidently. “Duravit BioTracking” is an ingenious system for home use and intended to deduce all manner of key health date from an analysis of your daily pee. It looks like it is ready for mass production, but in fact the analysis toilet is still in its infancy. But the booth proudly presents what will be possible at some point. The idea: to monitor your personal fitness, not to collect health data of medical relevance. 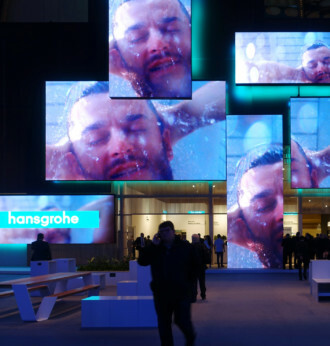 The ISH 2017 demonstrates that we can look forward to quite a few new things as regards bathroom electronics. Bathing in light: Burgbad’s “rc40” mirror cabinet provides both mood lighting and the right light for make-up. 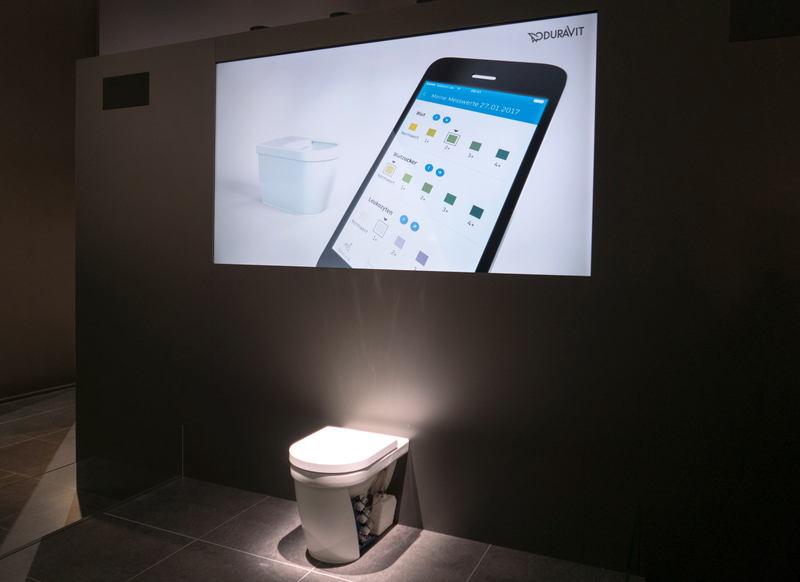 Geberit knows its plumbers and now meets their needs by app. An app a day keeps the doctor away: Duravit offers preventative care by urine analysis. The ISH is truly a fair that focuses on the future. Here, everything revolves very practically around water, energy and climate. And wherever you look you encounter the image of the digital worker.